West, Ian M. 2015. Whitecliff Bay, Isle of Wight, Geology of the Wessex Coast of England. By Ian West, Romsey. Internet site: www.southampton.ac.uk/~imw/Whitecliff-Bay.htm. 11th January 2015. 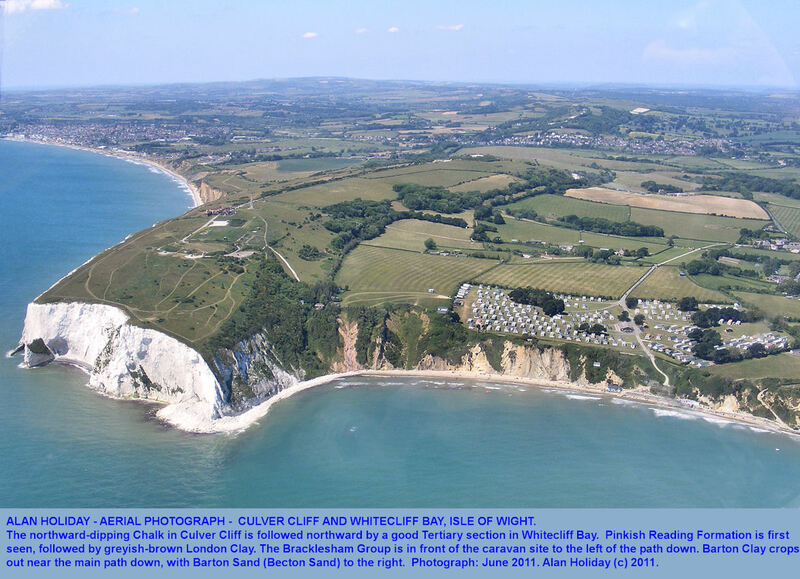 Vertical aerial photographs by courtesy of The Channel Coastal Observatory , National Oceanography Centre, Southampton. Whitecliff Bay is protected by a headland of Chalk cliffs in the south, but it is notable as probably the best exposure in southern England for Tertiary, Palaeogene, strata which are seen to the northeast of this. The cliffs of soft sands and clays provide one of the most important sections of Europe. Locally, they form a key, reference section for the younger strata of the Hampshire Basin. Most of the beds are vertical or steeply dipping and thus a large stratigraphical sequence is seen in a short geographical distance. 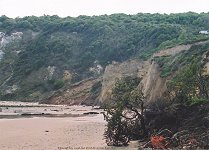 In little more than a kilometre of coastline, about 500m of late Palaeocene to late Eocene clays and sands are well-exposed. 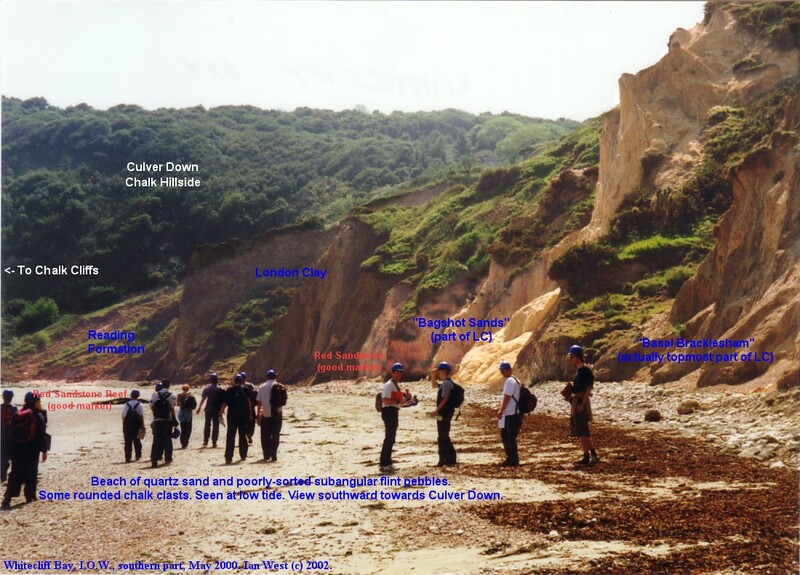 Very fossiliferous sediments are present, particularly in the marine London Clay, the marine Bracklesham Group and the lacustrine and lagoonal Solent Group, which includes the Headon Hill Formation and the Bembridge Limestone and Bembridge Marls. 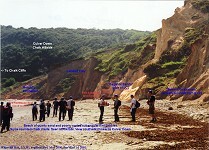 The cliffs of Tertiary sands and clays at the back of Whitecliff Bay and adjacent are not areas of high risk. Debris can fall from these cliffs especially in wet-weather conditions or when ice is melting. Generally these cliffs do not slope at a very steep angle. Safety helmets should be worn by members of parties and cliffs not climbed. Small landslides and mudslides take place in these cliffs, mostly at low angle, and there may be some soft mud. The tidal range is not great, but at high tide and especially in stormy weather the sea can reach the foot of the cliffs. 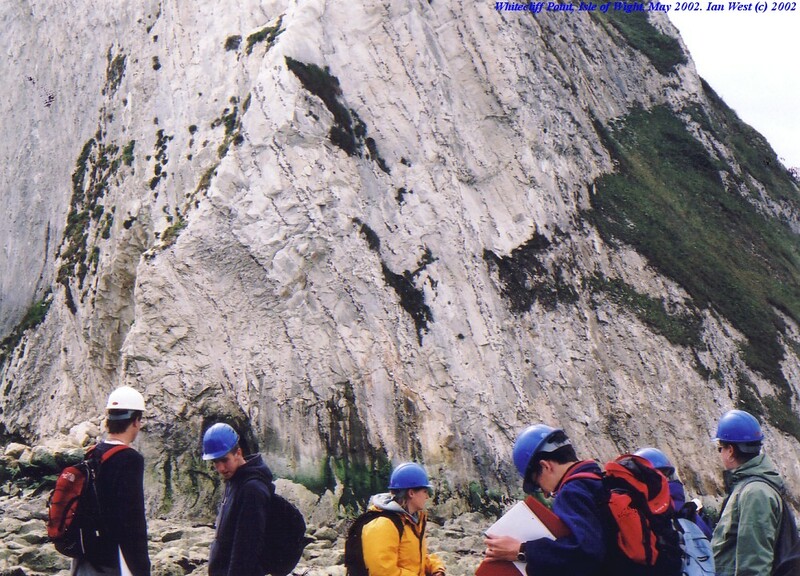 The Chalk cliffs in the southern part of the bay are slightly hazardous. There is some risk of falling pieces of chalk and flint in certain weather conditions. Watch for any signs of fresh chalk debris at the foot of the cliffs. Never hammer flints which can produce dangerous high-velocity splinters. At the northern end of the bay take care here with slippery rock ledges. One method of access to the bay is from Hillway Road, near Bembridge Airport, and down a gravel lane and path through a holiday camp. There are cafes in Whitecliff Bay but no toilets. Note that there is no suitable long-term parking for coaches if the gravel lane mentioned above is used for access. A coach can briefly set down and pick up passengers but has to leave for long-term parking elsewhere. 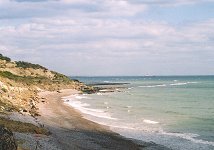 Whitecliff Bay can also be visited as part of a walking trip from Sandown or Bembridge. 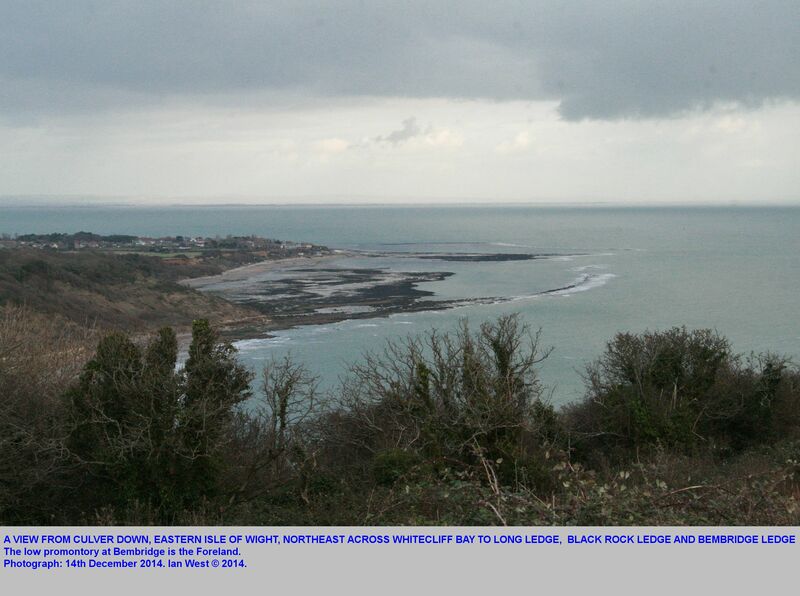 Study is recommended of the Ordnance Survey Map - Outdoor Leisure Sheet 29, 1:25,000, Isle of Wight. 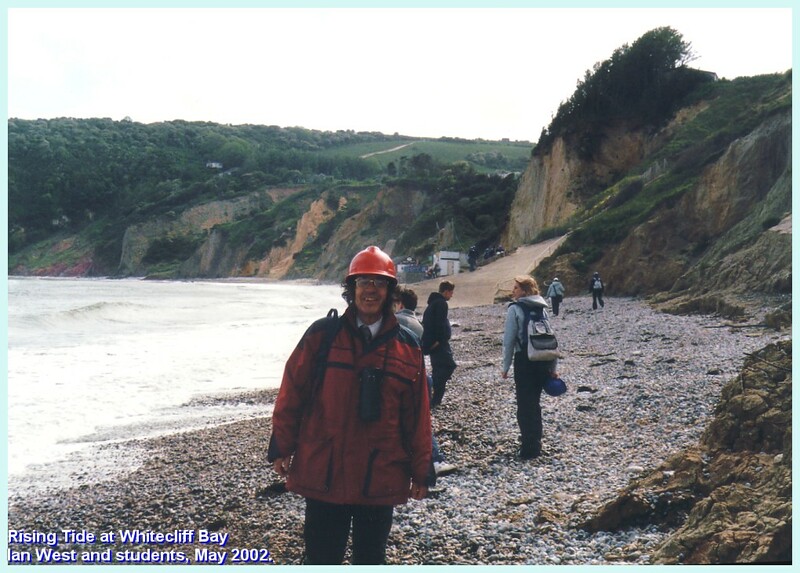 Geological or geomorphological fieldwork can be done at several levels at Whitecliff Bay. Above are some old photographs of student field trips to Whitecliff Bay in about 2002. More advanced sedimentological work could also be done here. The locality is good for more serious palaeontological or palaeoecological studies. It is excellent for projects on micropalaeontology, particularly nummulite studies, and for other specialist activities such as clay mineralogy or carbonate concretion petrography. The description will commence with the Chalk cliffs in the southernmost part of the bay and then proceed northward toward the ledges of Bembridge Limestone. 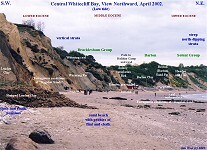 Whitecliff Bay is limited in its southern part by white cliffs, part of the promontory of Culver Cliff. At low tide the uppermost part of the Upper Chalk is easily accessible here to Whitecliff Point. From here Whitecliff Ledge borders the foot of the cliff southward to the sloping rock known as the Anvil, and shown in one of these photographs. There is no access around the foot of the cliff to Sandown Bay but you can observe good cliff sections in north dipping white chalk with flints. Compared to Alum Bay and to Studland Bay where the junction between the Chalk and Tertiary is seen, the east-west section is quite short. This cliff presents a stepped succession of highly-inclined bedding planes of the Mucronata Zone. Most of the surface is grey with micro-vegetation, but fossils are well seen in the fallen blocks at the Point and other places tests of the echinoid (sea-urchin) Echinocorys can be seen (White, 1921). The regular echinoid, Salenia geometrica Forbes, has been reported by Rowe (1908) and so too has Aptychus portlocki Sharpe (an aptychus is one of a pair of flaps used to close the aperture of an ammonite that retreated into its shell). Chalk Cliff Fall, Whitecliff Bay, 2007. Moreno, J. 2007. Warning after major cliff fall. Local newspaper report. Monday, May 21, 2007. By Jon Moreno - Monday, May 21, 2007. [A photograph of Culver Cliff. 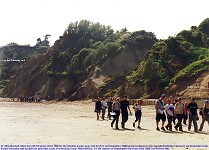 - Scene after the cliff fall at Whitecliff Bay, Bembridge. 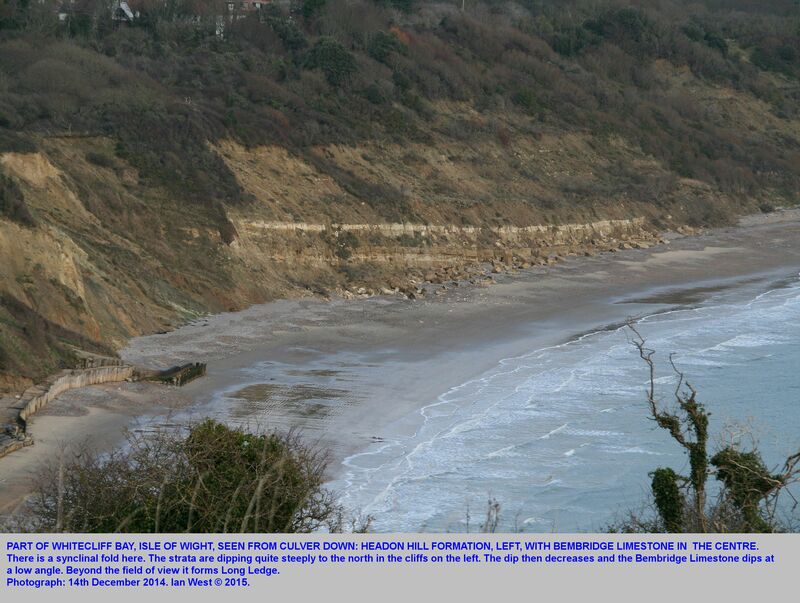 Picture courtesy of Sandown and Shanklin Inshore Lifeboat.] Coastguardsd are warning the public to stay away from the cliff edge at Whitecliff Bay following a major cliff fall on Saturday. 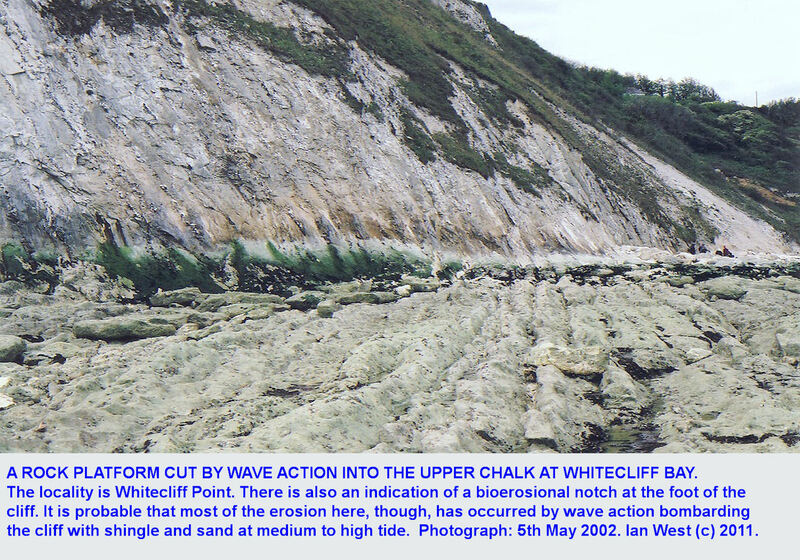 A massive chunk of chalk cliff at Bembridge collapsed into the sea at around midday. 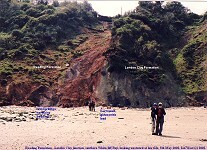 The alarm was raised by a member of the public who saw the landslide. Coastguard rescue officers from Bembridge and an Island coastguard representative went to the scene to assess the extent of the fall and cordon off the area. The coastguard rescue helicopter, India Juliet, was scrambled to make sure no-one was trapped. 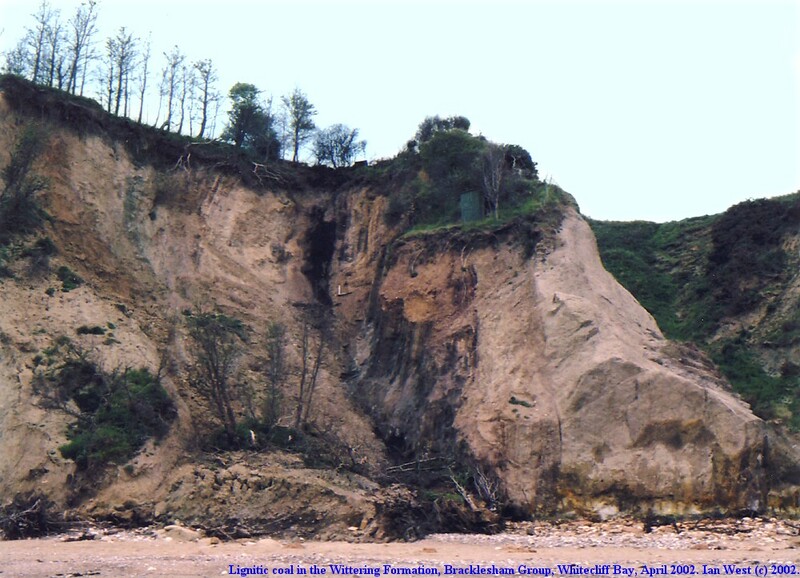 It is believed onlookers at Whitecliff Bay heard a loud rumble and saw the cliff edge collapse into the sea. The noise was immediately followed by a cloud of white dust. Watch manager Nigel Guyll, of the Solent Maritime Rescue Co-ordination Centre, said: "There were no people trapped by the fall. It would appear we have been very fortunate no people were in the near vicinity at the time. "This is a popular location for anglers and we would stress the enormous importance to the public to stay away from the area. There has been a significant landslip which has left the area very unstable with the strong possibility of further slips." 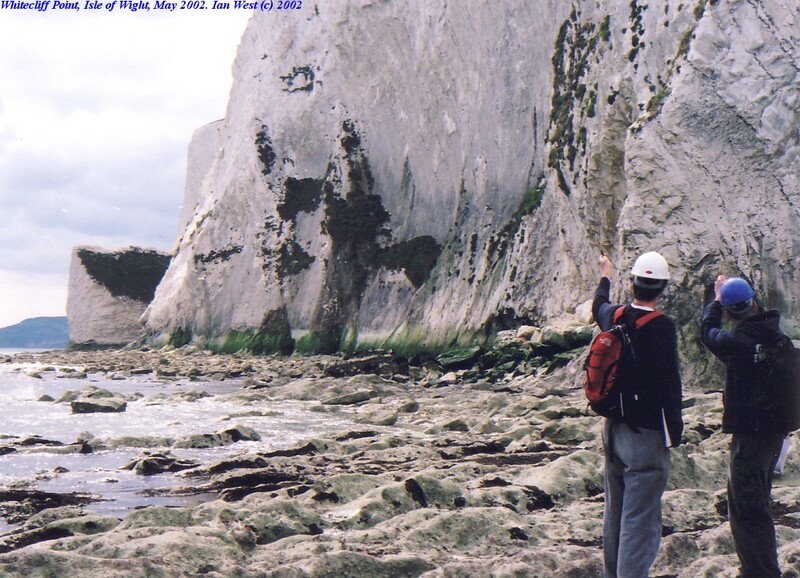 The Tertiary (Palaeocene and Eocene) succession in the southern part of Whitecliff Bay is vertical. 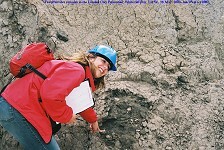 The strata are well-exposed and parts of it are fossiliferous. 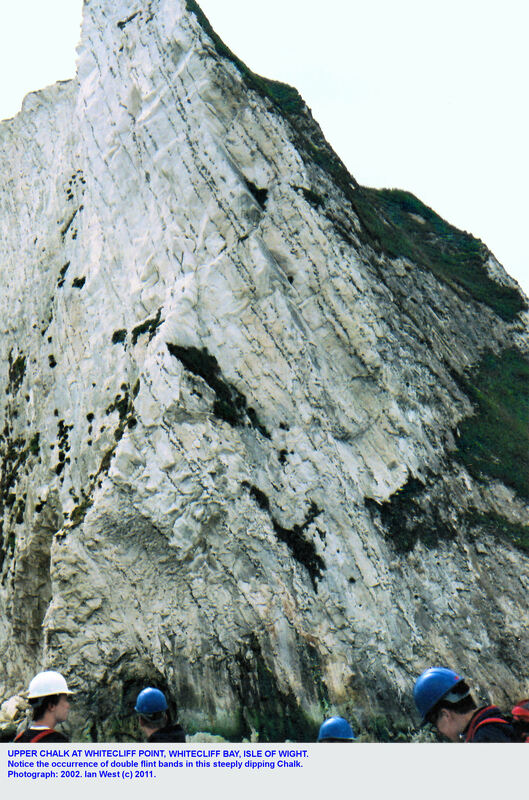 The Chalk cliffs are obvious, of course, but the junction with the Tertiary strata is mostly obscured by landslipping. Recognising the main units of the Tertiary is easy, but identifying the subdivisions of the Bracklesham Group requires more experience. 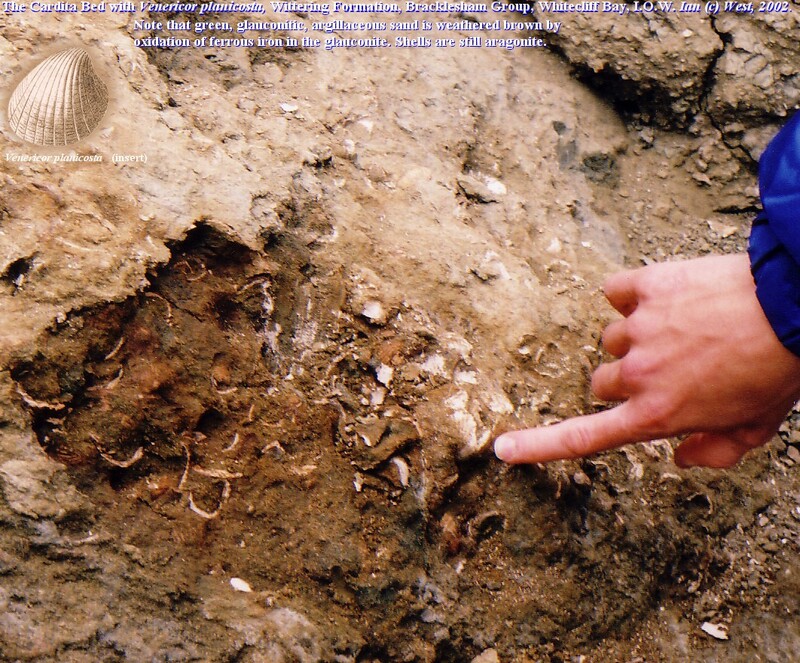 The photographs here shows the lowest part of the Tertiary from Palaeocene to almost the base of the middle Eocene. 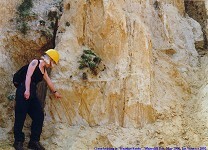 The lowest of three major lithological units shown is the Reading Formation which lies unconformably on an eroded surface of Campanian Chalk (part of the mucronata Zone with much of it missing). The Reading Formation is recognised by its reddish, mottled silty clays, and it is much slumped in the cliff. Above it is the London Clay Formation (of the Thames Group of King, 1981 ) which is a distinctive firm brownish-grey clay with whitish aragonitic shells of marine molluscs in places. It contains some grey septarian nodules aligned vertically in the cliff. As orginally used here the term London Clay referred to the clay which underlies the yellowish sands of the Portsmouth Sand Member and the Whitecliff Sand Member ("Bagshot Sands"). These sands are clearly seen in the photograph and are quite distinctive. About 11m (37 feet) above the base of the sands is a distinctive brownish-red sandstone which is iron-cemented. This relatively hard bed forms a narrow reef running down the shore at low tide. The reef does not appear red but is green with sea-weed. It is the most distinctive reef in the southern part of the bay and forms a good marker to fix a position in the succession. Thus the Portsmouth and Whitecliff Sand Members can hardly be missed and form a conspicuous yellow cliff with much graffiti carved in it. 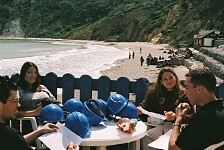 Modern work has placed the sands within, rather than above, the London Clay Formation of the Thames Group (King, 1981; Edwards and Freshney, 1987 and Insole et al., 1998). The Bracklesham Group does not start at the pebble bed immediately about the sands, as in the old literature, but a short distance above it. Above the Portsmouth Sand and Whitecliff Sand Members ("Bagshot Sands") the succession is very interesting and fossiliferous, but it is a little complicated. It mostly consists of Bracklesham strata until after the southernmost of the two seafront cafes. The Bracklesham Group is much subdivided, not only into formations, but also into named and numbered beds. Some of these are unusual and important. We well deal with the details later. For the moment notice a succession of greenish (glauconitic) clayey sands and laminated, brownish-grey, sandy clays with shell beds in places. The obvious marker here is the "coal" or lignite bed which can be seen in the cliff and at low tide on the shore as a black unit a short distance south of the southern cafe. Find this marker bed to fix your position. It occurs in the Wittering Formation, of the lower Bracklesham Group. Fossiliferous glauconitic sands (Earnley Formation of the Bracklesham Group) occur above it. These will be discussed in more detail below. 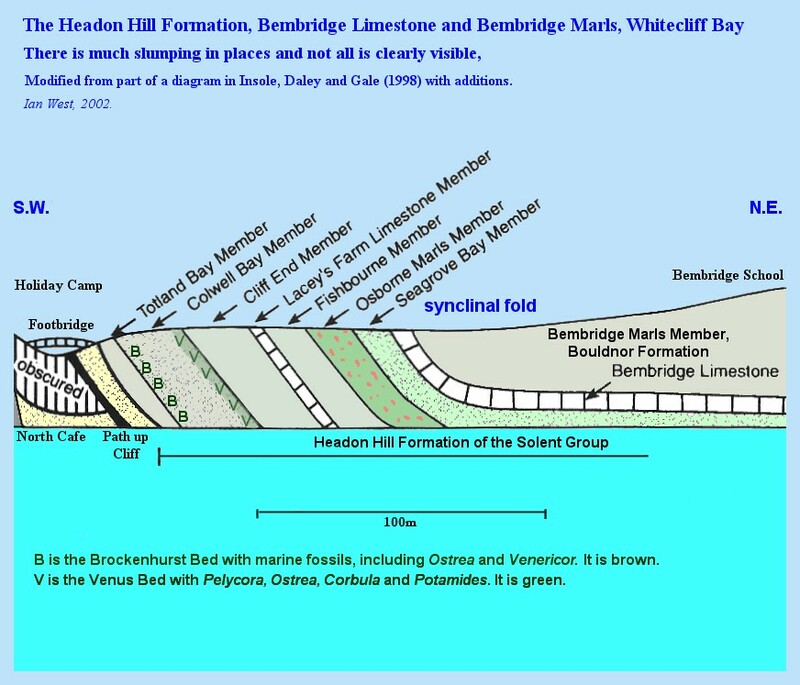 Having commenced at the southern end of the bay, the various units continuing up stratigraphically (and northeastward in the bay) up to the Bembridge Limestone and Bembridge Marls will be discussed below. The reddish coloured marls which have to a large extent slumped down the cliff in the southern corner of Whitecliff Bay are of the Reading Formation. Its thickness is between 46m (150ft) and 49m (160ft) according to White (1921) . At Alum Bay, in contrast, it is less than 27m (90ft), according to White (1921) but was measured at 40m by Buurman (1980) . According to Curry (1967) the Reading Formation belongs to the Sparnacian Stage of the Palaeocene. The junction with the Chalk is not clearly seen at beach level at present. 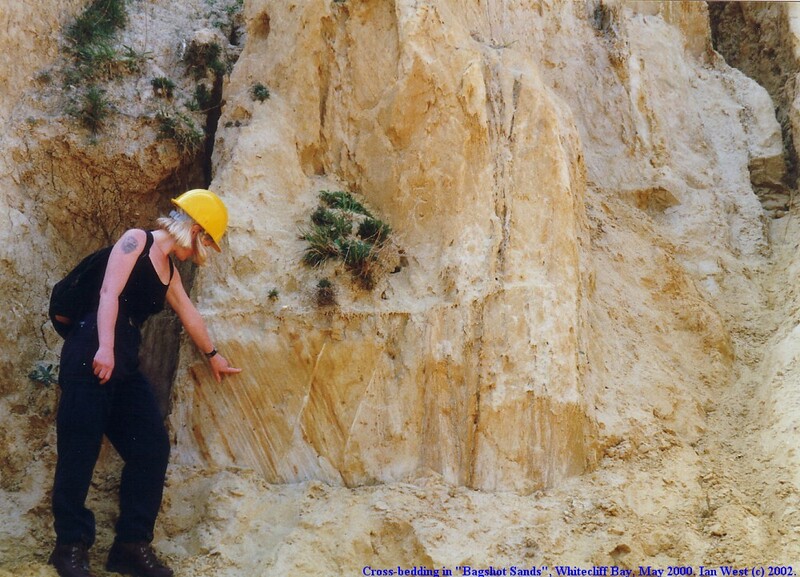 There is no obvious angular discordance between this Palaeocene deposit and the Cretaceous Chalk. The top surface of the Chalk is nearly smooth except for scattered hemispherical hollows or pot-holes, up to 0.3m (1 ft) in diameter containing loose flints and chalky sand from which little springs exude, according to (White, 1921) . No Lithodomous borings, as might be expected on a shallow seafloor, have been found. This is the Reading Formation Bottom Bed (Insole et al., 1998). The sandy bottom bed, about 1.2m thick (4ft) is full of broken, unworn flints and relatively few flint pebbles. It resembles the sandy type of Clay-with-Flints, the Quaternary residual deposit, often found on Chalk uplands. This flinty and loamy sand probably includes relics of old subaerial accumulations, but the character of the underlying surface makes it unlikely that it has been formed in situ by weathering of the Chalk. It is more likely of normal marine origin, as is the normal type of Reading Bottom Bed on the mainland. There the usual basal horizon is a green, glauconitic bed with oysters and sharks' teeth. Here, the brown, ochreous colour of the Bottom Bed (visible in the photograph as a brown patch adjacent to the Chalk), which increases the resemblance to Clay-with-Flints, is probably due to decomposition of glauconite that was originally present (White, 1921) . Glauconite is a green clay mineral, a complex aluminium silicate containing both ferrous and ferric iron. It is preserved unoxidised in greenish beds of the Bracklesham Group, stratigraphically higher in the Whitecliff Bay cliff section. There it is protected from oxidising water, at least to some extent, by clay. 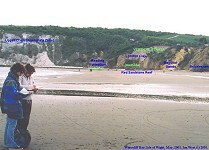 The Reading Bottom Bed on the Isle of Wight, however, is exposed in cliff sections where it is not only in the vadose zone (above the water-table) but because of its contact with the Chalk is subject to oxidation by meteoric, freshwater which circulate freely through the permeable Chalk. Above the sands and clasts of the Bottom Bed there is a third of a metre of laminated, grey, sandy marl with some fine calcareous debris from the Chalk, partly replaced by minute concretions. Much of the remainder of the Reading Formation is covered by landslips, as visible in the photograph. The grey marl, however, can be traced into continental-type mottled reddish and purplish-grey plastic clay. 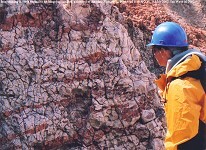 The reddish or pink colour can be seen in the mudslides at the exposure of the Reading Formation in the photograph above. The reddish mottled clays of the Reading Formation are probably palaeosols. These are mostly ancient, gley or pseudogley soils (Buurman, 1980) . Gleys are typically mottled clays that have originated in marshy floodplain conditions, in which there are phases of oxidation at low water level, and some reduction at higher water levels. This oxidation and reduction is patchy. Brown limonite or goethite (hydrated ferric oxide - like rust) patches, normal in gleys, have been transformed in this case in the direction of hematite ( red ferric oxide without water of crystallisation), either by warm penecontemporaneous conditions (Buurman, 1980) or by the heat of burial and by time . The mottling is because gley soils are subjected to fluctuating water levels and fluctuating oxidising and reducing conditions in time and in space. Buried organic matter can cause reduced grey, white or greenish patches in redder clay, and alternatively cracks or holes allowing air to get to the sediments can cause oxidation to red. 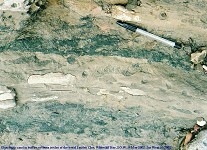 The photographs above show a cross-section and the upper bedding-plane surface of light grey, slightly pinkish, silty clay which contains brownish red tubule-like stains. These reddish markings penetrate through the bed in a somewhat irregular manner, and might be oxidised features following roots. If this is the case they may represent the surrounds of tubules left by rotting roots through which oxygen could enter. They do seem to resemble rhizoconcretions (root-concretions) which can occur in similar continental facies. The mineral composition has not been studied; siderite might be present. The problem with roots, however, is that they are more likely to have remained as sources of organic matter and to have caused reduction. Is there some other explanation? Could these have been some sort of cracks allowing entry of air? The shape does not seem appropriate to desiccation cracks; in cross section some of these are circular. Might they be the remains of burrows? It is perhaps, possible, but they seem too long, penetrating the strata for two great a stratigraphically vertical distance. What do you think? As an afterthought a further possibility comes to mind. The red tubules might have been pyritic rhizoconcretions at one stage, and then penecontemporaneously oxidised. At a time of high water-level, local reducing conditions associated with the organic matter of the roots could have been favourable to sulphate-reducing bacteria, leading to sulphide production and localised trapping of iron as pyrite. A fall in the water-table would have resulted in oxidation of the pyrite to brown iron oxides. Supporting this idea is the occurrence of pyrite in Phragmites (reed) stems in the Holocene estuarine deposits of Southampton Water, although in this case, the pyrite remains reduced. Obviously some laboratory work is needed. Perhaps, a student project on these ferruginous objects would be useful, especially with data obtained on mineralogy by XRD, thin-section petrography and some clay mineralogy. Notice the cracking of the clay. The weather was not particular hot and dry at the times of the photographs. The clay has probably long been dried out to some extent at the surface. It was originally, under burial, beneath the water-table, i.e. in the phreatic zone, and it was also under pressure from the weight of overlying strata. 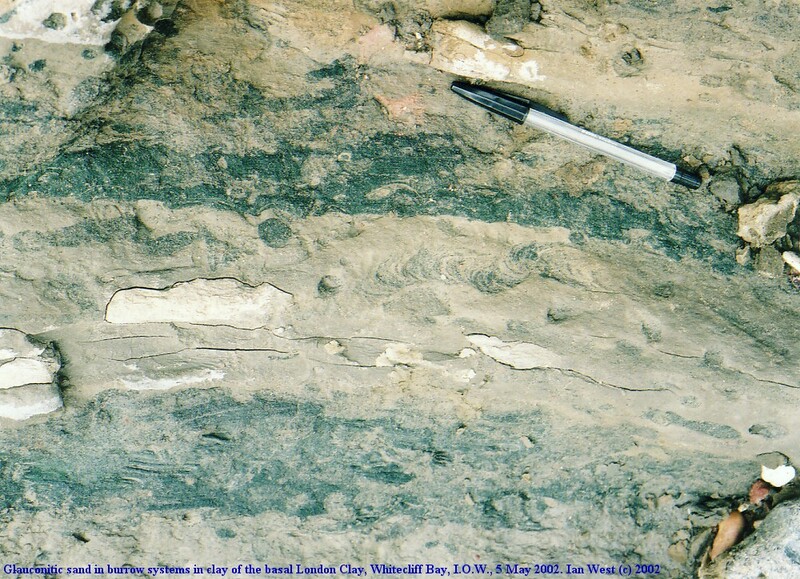 The top of the mottled and reddish clays of the Reading is visible in situ at the northern margin of the slips and there is a sharp and gently undulate contact with the hard conglomeratic sandstone in the basement bed of the London Clay Formation of the Thames Group (White, 1921) . The Origin of the Red Colour. It is interesting that in the Palaeocene and Eocene succession at Whitecliff Bay only the Reading Formation has any significant quantity of reddish beds. They are clearly not of desert origin like Permo-Triassic red beds, but have similarities to reddish beds in the Cretaceous Wealden and many other formations. The usual initial form of iron oxide in floodplain soils like this is brown limonite or goethite. The question arises as to whether the red colour is original (penecontemporaneous) or due to the warmer temperatures of burial dehydrating the hydrated ferric oxides (limonite etc). An interesting little exercise is to attempt to estimate a very approximate burial temperature to which the Reading Formation beneath the Isle of Wight has been subjected. 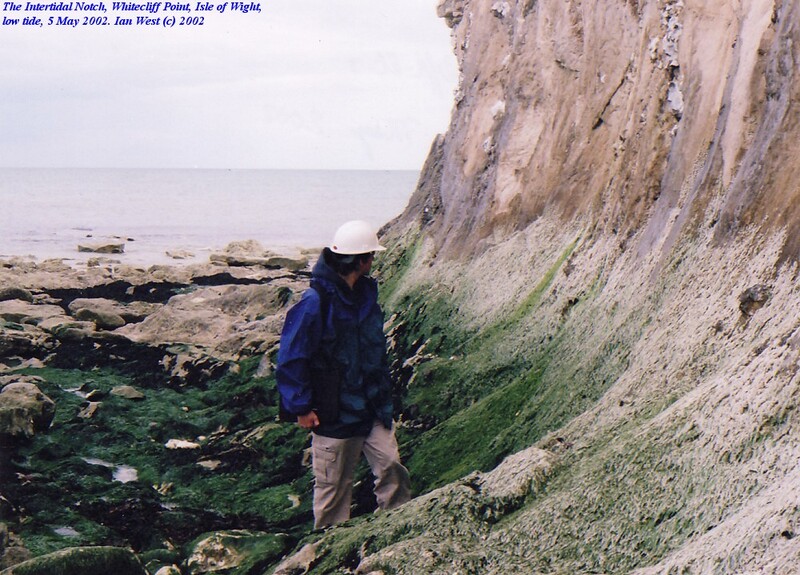 First note that there is a maximum of about 650m of Palaeogene in the northern Isle of Wight. Using a typical geothermal gradient (about 30 degree per km in very round figures), it is possible to roughly estimate the maximum increase in temperature caused by the burial to which the Reading strata have been subjected. This is about 20 degrees Centigrade. Add the surface temperature for the time (about Miocene), roughly estimated. Perhaps the surface temperature was about 10 degrees. Thus the Reading Formation might have been at about 30 degrees under burial. This is a very approximate figure. If the maximum sediment thickness was acquired early enough the surface temperate might have been 15 degrees or more. The geothermal gradient might possibly have been upto 30% greater. This would give 26 degrees plus 15 making a total of 41 degrees as a maximum. It is therefore reasonable to consider 30 to 40 degrees as maximum burial temperature for the Reading Formation. Possibly because of early movement on the moncline, a thickness rather less than 650m at this exact location is likely, and that the geothermal gradient was not much higher than 30 degrees at this time. This is only speculation but a maximum burial temperature of about 35 degrees, therefore, seems likely. It is useful to have some idea of burial temperatures, but was this the real reason for the red colour. 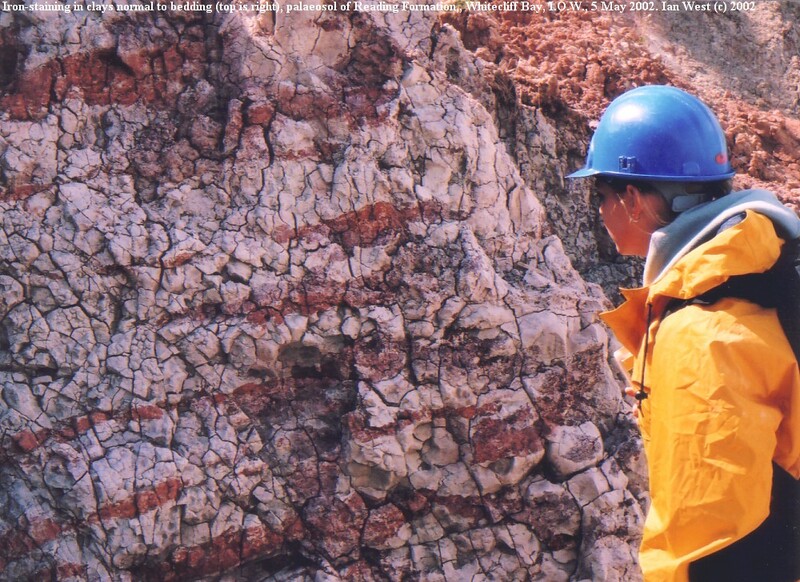 Progressive burial of sediments in Baja California has indeed led to progressive redenning. Is the red colour original though? Perhaps, in favour of this view is the evidence that the Reading Formation is reddish at most localities irrespective of burial depth. Furthermore, as (Buurman, 1980) has noted, at the present day there are hydromorphic soils (gleys and pseudogleys etc) with red iron segregations for example in South America (see Buurman for references) and in southeast Asia. If a penecontemporaneous reddening is considered, this accords well with the Indo-Malaysian climate proposed by Reid and Chandler (1933) in spite of the relatively high palaeolatitude, and with a mean annual temperature of 21 degrees assumed by Frakes and Kemp (1972) for the Eocene of Western Europe. Thus there is not necessarily any need to argue for burial alteration. Yet another theory for strong colouring is admixture of volcanic material as suggested by Hester (1965-1966). This is not necessary and there does not seem to be sufficient evidence in favour of it. The London Clay was included within a Thames Group by King, 1981) because he regarded the basement bed as a separate "Oldhaven Formation". This was not regarded as a separate formation by Edwards and Freshney (1987) . Note that the later sense of use of the term, as in (Insole et al. 1998), includes the "Bagshot Sands" above, which are distinctive in the field, at least here, and are shown separately in older books and papers. However, see figs. 1 and 2 of Edwards and Freshney (1987) to see that the matter is not simple. The dominantly clay unit of the extended London Clay Formation gives a general impression of being a vertical unit of brownish, slightly sandy clay with some whitish bivalves and with some grey hard septarian nodules. Pyrite occurs within it in places. This dark clay is always easily recognised because it comes above the reddish mottled Reading Formation. 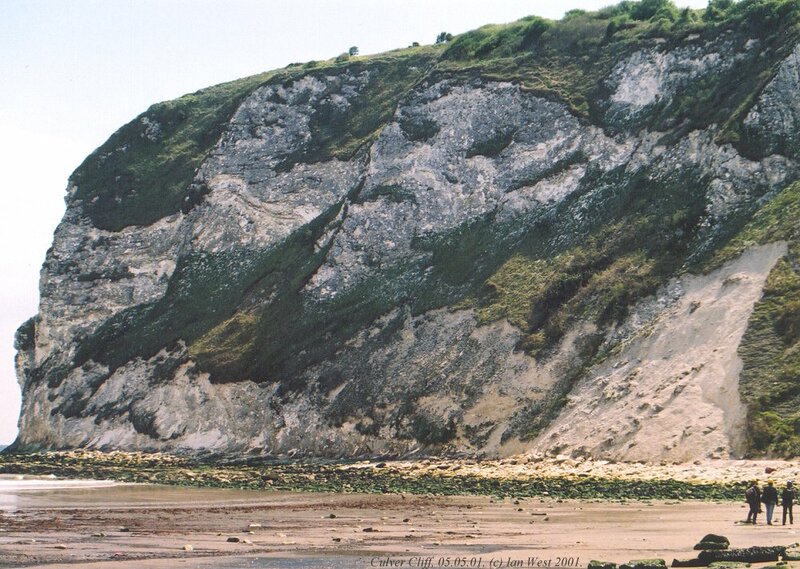 It forms easily eroded and somewhat slumped cliffs (but not as slumped as the Reading cliffs), and can be seen here at Whitecliff Bay, at Alum Bay on the west of the Island and is very poorly exposed at Studland Bay in the Isle of Purbeck. In the London Basin the Isle of Sheppey is a famous locality for the London Clay and London Clay fossils. The London Clay of the Hampshire Basin is more sandy than that of the London Basin, where it has proved an excellent impermeable stratum for keeping water out of the London Underground Railway system. 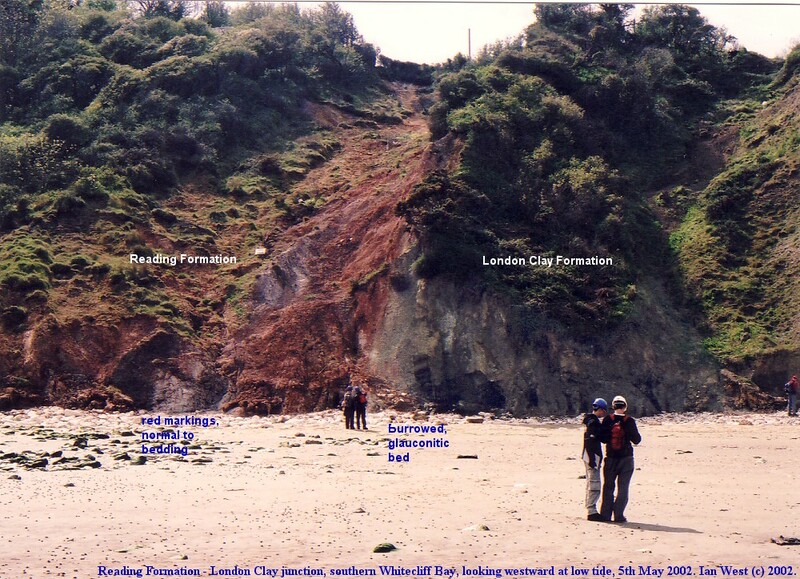 At Whitecliff Bay the London Clay consists of 98.2m (322 ft) of clay (the "London Clay" in the old literature) and a unit of sands above (the "Bagshot Sands" in the old literature) which is of 40.1m (138 ft) thick. Thus the total is now 140.3m (460 ft) using the figures from White (1921) . Looked at more closely, you will see that the formation is made up of alternations of blue to brown clays and grey to buff sands, the change from one type to another in some cases being gradual and in others being abrupt (White, 1921) . More recent study (King, 1981) has led to sedimentological interpretations. These show that the formation largely consists of a series of coarsening-upward units. Each has a sharp base marked by pebbles, representing a transgressive event. Above come silty muds with marine fossils and usually glauconite, indicating a gradual increase in the water-depth. The upper part is characterised by two lithologies, both of which reflect shallowing associated with periods of regression. One is of laminated silty sands and muds (heterolithic - i.e. of varied lithologies). 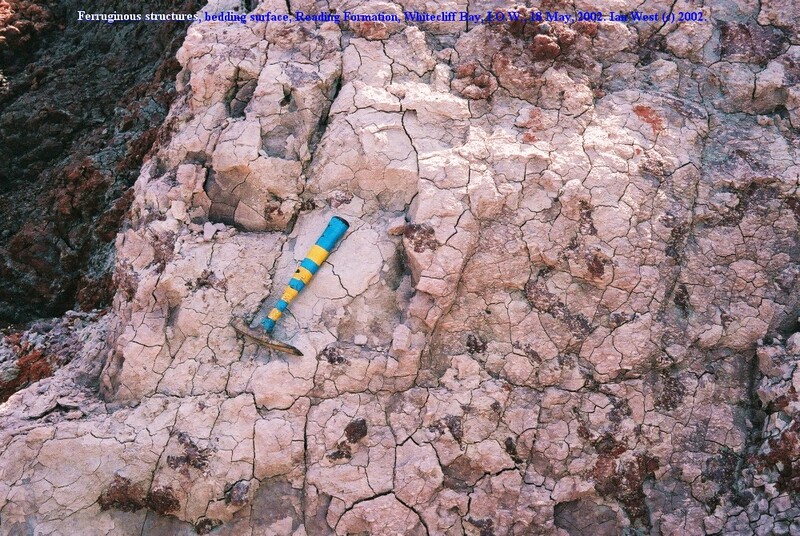 This type is believed to represent tidal-flat deposits, which are common in the Tertiary of this region. The other comprises well-sorted, cross bedded sands which are considered to have been deposited in tidal channels. These were called the "Bagshot Sands" in the older publications. 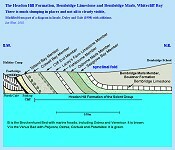 They are now assigned to two members within the London Clay, the Portsmouth Sand which is the lower part and the Whitecliff Sand above (Insole et al., 1998). Some further information on these follows in a section below. The basement bed of the London Clay is a glauconitic pebble bed, with some cross bedding and a variable amount of red, ochreous plastic clay. The presence of these clay clasts together with an uneven base suggested to (White, 1921) that there had been penetemporaneous erosion of the underlying Reading Formation. As shown in the photograph here there are burrows in clay with glauconitic sand infill. They show spriete and are probably of the trace fossil Rhizocorallium. They would have been made by burrowing crustaceans. In favourable conditions of exposure these are clearly visible just above the top of the Reading Formation. Septarian nodules occur in the sandy clays at intervals. In the upper part of the clay, not far above the middle, there is a band of spheroidal concretions. The London Clay here is quite fossiliferous, although specimens are very friable and usually broken by the drying and cracking of the clay. The shells of bivalves are mostly preserved as white, rather crumbly aragonite, quite conspicuous on exposed surfaces of the grey clay, as shown in the left-hand phtograph . The diagenetic replacement of the aragonite by calcite, so common in older strata, has not usually occurred here. Fossils include the worm tubes Ditrupa plana (in the basement bed) and Vermicularia bognoriensis. Bivalves are often in life positions (biocoenosis). They include such as Glycimeris corrugata, Pholadomya margaritacea, Axinaea brevisostris, Meretrix suessoniensis, Arca impolita, Pinna affinis, , Arctica scutellaria and, at the top of the clay, Protocardia nitens . Look for the common bivalve Pholadomya margaritacea in the lower part and the large and distinctive Pinna affinis (shown in the right-hand photograph above) in the upper part. These last two are some of the most well-known London Clay fossils. 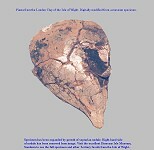 The Pinna specimen shown incidently is in a siderite nodules and shows the cracking produced by the usual expansive growth of the nodule (the Todd 1913 theory). Pieces of fossil wood - lignite occur scattered throughout the lowest part of the formation (White, 1921) . Some of the London Clay fossils are shown in the old illustration of Lowry, the middle image above. Several old names shown on the drawing are no longer in use and modern names are given below them. These yellow sands are described separately in older publications, such as the Geological Survey memoir and map. As noted above, they are, however, now included within the upper part of the London Clay Formation as in Edwards and Freshney (1987) and in (Insole et al. 1998). The sands at Alum Bay, formerly known as Bagshot Sands are notable for containing a pipe-clay with a flora of tropical figs, Aralias and leguminous plants (White, 1921) , even though they have originated in a temperate latitude. This is a consequence of the warm, frost-free Eocene climate. The Portsmouth and Whitecliff Sand Members at Whitecliff Bay, however, have only thin seams and partings of pipe clay in a sequence of yellow, grey and white sand, much of them micaceous. 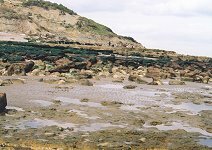 An iron-cemented sandstone towards the base of the Portsmouth Member forms the most conspicuous of the foreshore reefs between the Chalk and the Bembridge Limestone in Whitecliff Bay. Discussion points for students: - Should the London Clay and the "Bagshot Sands" really have been put together in one formation? Think above the rules of lithostratigraphic nomenclature. How would they apply to this? Do you think that they are being broken here or this scheme satisfactory? Is the problem one of diachronism, and if so, how should it be dealt with? This sequence consists of units of glauconitic argillaceous sands and sandy clays with marine molluscs alternating with units of laminated grey sandy clays with lignite. These units have separate formation names. Overall, the glauconitic shelly beds are conspicuous and a notable feature is the occurrence of nummulites. Interesting features are rootlet beds and a lignitic coal. The well-exposed and continuous Bracklesham sequence here is used to understand partial or incompletely exposed successions of these strata, as at Lee-on-the-Solent, in the Fawley Transmission Tunnel (Curry, Hodson and West, 1968),. The type section of Bracklesham Bay has important fossiliferous horizons visible at certain tide conditions. It does not, however, have the almost continuous exposure seen here. Wittering Formation (53m) - greyish brown, laminated sandy clays (heterolithic) with lignite and a coal (- at the base). 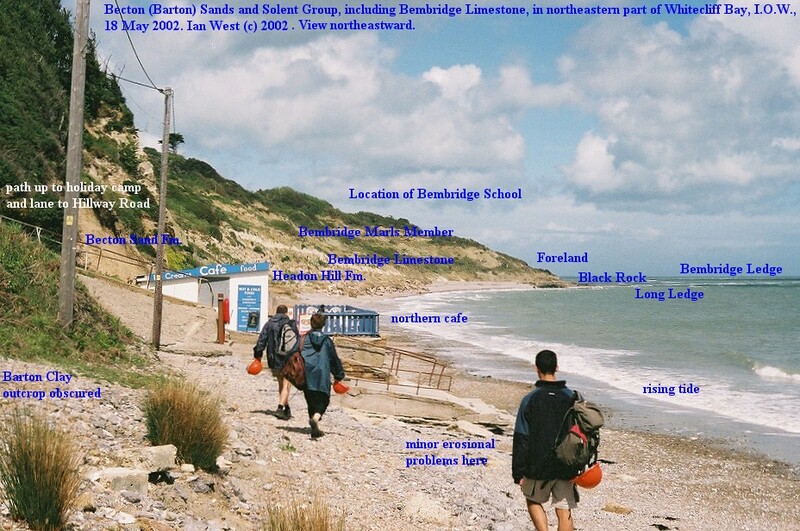 This image shows the general positions of the Bracklesham strata and its relationship to the London Clay Formation beneath, including the "Bagshot Sands", and to to the general position of the Barton Clay and Becton Sand (Barton Sand) above. The Headon Hill Formation of the Solent Group lies beyond (northward). Note that the two cafes mark and area of poorly exposed slumped cliffs with much clay and this section corresponds to the top of the Bracklesham Group, that is part of the Selsey Formation and the more extensive stretch of Barton Clay. Some simple sea-defences have been constructed in this slumped clay area. 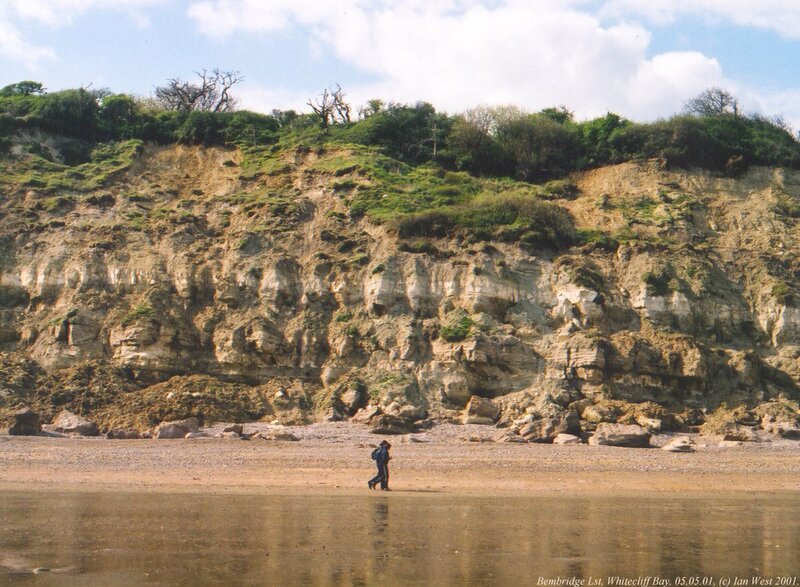 The lowest (southernmost) of the main fossil beds to be found in the Bracklesham Group of Whitecliff Bay is the Cardita Bed, a type of ancient "cockle" bed. This is in the Wittering Formation, the lowest unit of the Bracklesham Group; it is lower (south) of the conspicuous lignitic coal bed and easily found. The bed contains what was known as "Cardita planicosta " the very robust, cockle-like, bivalve, now referred to as Venericor planicosta (Lamarck). The flat-ribbed shells are abundant in the greenish to brownish, argillaceous glauconitic sand. Oxidation of the ferrous iron in the glauconite (an interesting mineral with both ferrous and ferric iron) has resulted in a rusty colour in the cliff. This is because the bed is here about the water-table, in the vadose zone, and oxigenated, meteoric water can percolate through it. Aragonite unstable in contact with meteoric water, but because cliff erosion is fairly rapid the shells have not been subjected to meteoric water for a long time (in geological terms), and the clay content has helped to reduce their contact with this. Thus the aragonite is preserved but in rather crumbly, white condition (note how it has been streaked out by the hammer blow). Thus, this is not the ideal place to find very good specimens. 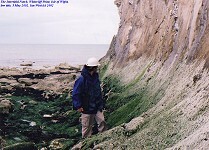 At Bracklesham Bay, near Selsey Bill, the equivalent strata are exposed at low-tide and have not been subject to so much weathering. Here the shells are better preserved, and an example is shown below. For the same reason the shells have been found in well-preserved conditions in excavations at Southampton Docks. The mollusc, which has relatives extending from the Cretaceous to the Recent, was probably a shallow-burrowing, suspension feeder. With such a robust shell it could live in argillaceous sand subject to vigorous wave action. The shells at Whitecliff Bay are not at their maximum size. Larger specimens, as shown in the illustration, have been found in Sussex. Some further comments on the size aspect have been made by Bristow (1862). " The lower part of the this group [part of the Wittering Formation] is represented in Whitecliff Bay by green clayey sands with Cardita planicosta [Venericor planicosta ], Turritella imbricateria, Venus etc. 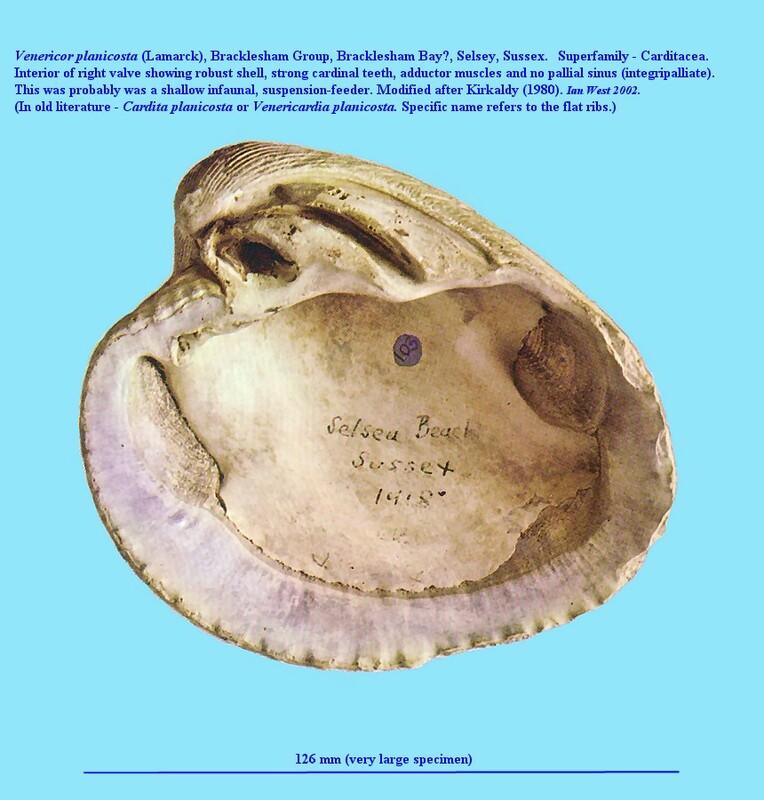 ..the Cardita is not only much less in size than the species found at Bracklesham, but is pierced by small boring shells, showing that the animals must have perished and the shells remained at the bottom of the sea before they were covered by the sediment in which they are now buried." In other words this is not a life assemblage, a biocoenose, but a death assemblage, a thanatocoenose. It probably represents storm-reworked, muddy, glauconitic shoal sands with "cockles". The smaller size of the shells may be the result of a less favourable environment than elsewhere, and is perhaps due to a very slightly lower salinity at Whitecliff Bay, closer to the western influx of freshwater than the Selsey Bill area. Comparison might be made with modern cockle (Cardium or Cerastoderma) shells which show size changes in relation to the salinity of the aquatic environment (West, 1983). 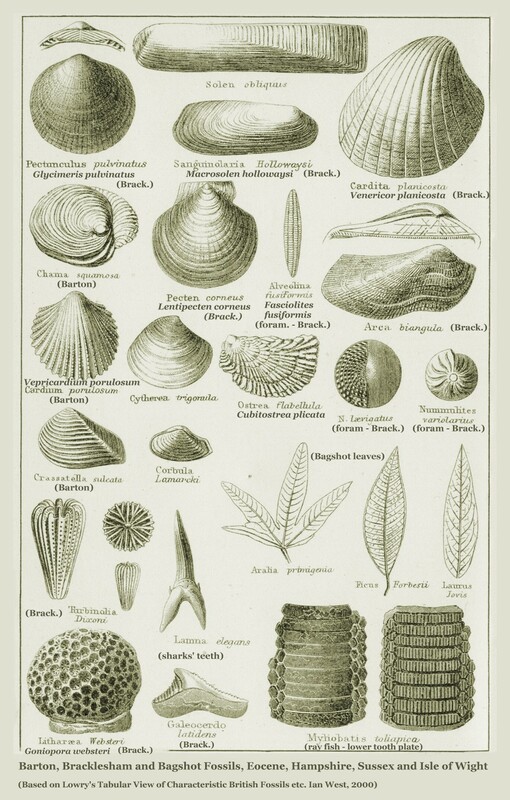 The collection of fossils from these and other Bracklesham shelly horizons has been discussed by Norman (1887). "I have found that the best way to collect the fossils from these sandy beds of Whitecliff Bay, is to leave them on the clay, and pare off the surrounding matrix with a small pocket knife, leaving them on the beach to dry while collecting others. Each specimen should be carefully rolled up in paper, and placed securely in a wooden box, great care being necessary as most of these fossils are extremely friable and many of them badly preserved. 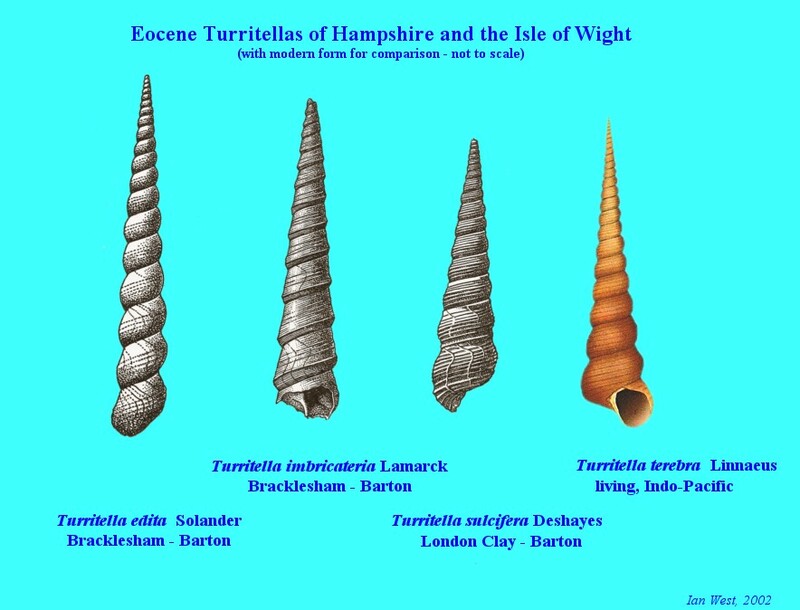 Some of the Turritella imbricateria and Cardita planicosta are large, and the shells of the latter are very thick." Venericor planicosta is not the only fossil of these strata. White (1921), in a description of the section based on the work of Fisher (1862), described the Cardita Bed, bed IV (number 9 on the section), as follows: "Calcareous loamy sand with Nummulites laevigatus Brug., Ostrea flabellula Lamarck, Cardita planicosta Lamarck, Cytherea suberycinoides Deshayes (Meretrix ), Turritella imbricateria Lamarck. " The thickness is given as 52 feet or 15.8 m. In this sense it is a thick unit and the shell bed shown in the photograph forms only a small part of it. Lignite occurs in the bed beneath it and above it is the strata with lignitic coal. A very near-shore marine environment seems likely, although it had to be one suitable for the formation of glauconite. 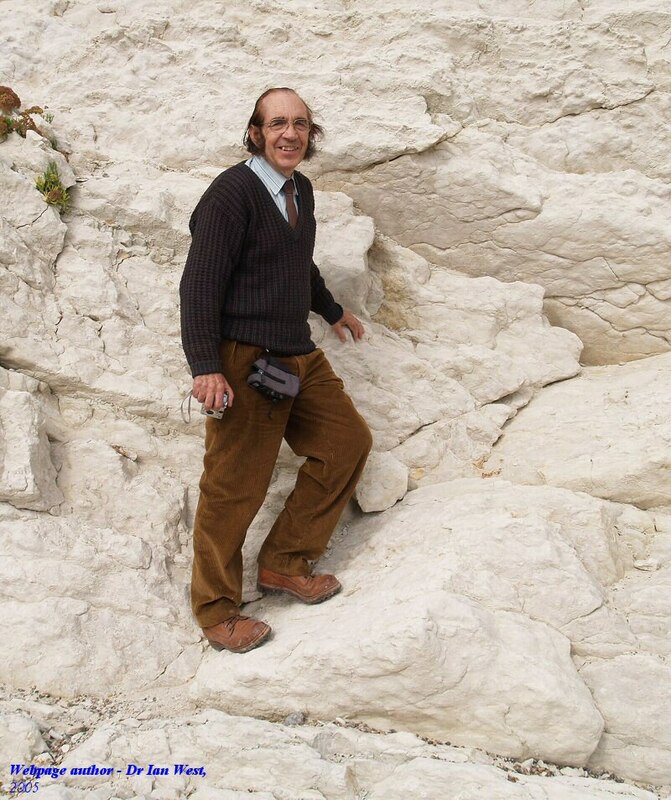 The Bracklesham strata of Whitecliff Bay are very fossiliferous at certain horizons. 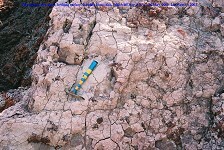 The most notable beds are argillaceous, glauconitic sands in the Earnley Formation of this Group. These greensands are exposed just south of the southern of the two cafes. They contain the nummulite Nummulites laevigatus, the shell of a giant protozoan, the remains of a huge single cell. In the Wittering Formation, below the coal the Cardita Bed is easily found. 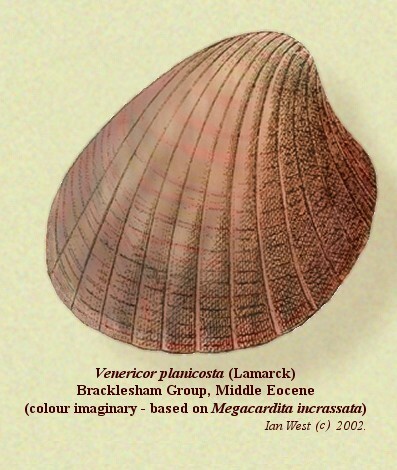 It consists of argillaceous glauconitic sand with the white aragonite shells of Venericor planicosta, shown here with colour reconstructed (imaginary but based on a living Australian relative). Shells of the turreted gastropod Turritella (Haustator) imbricateria also occur in the Cardita Bed. 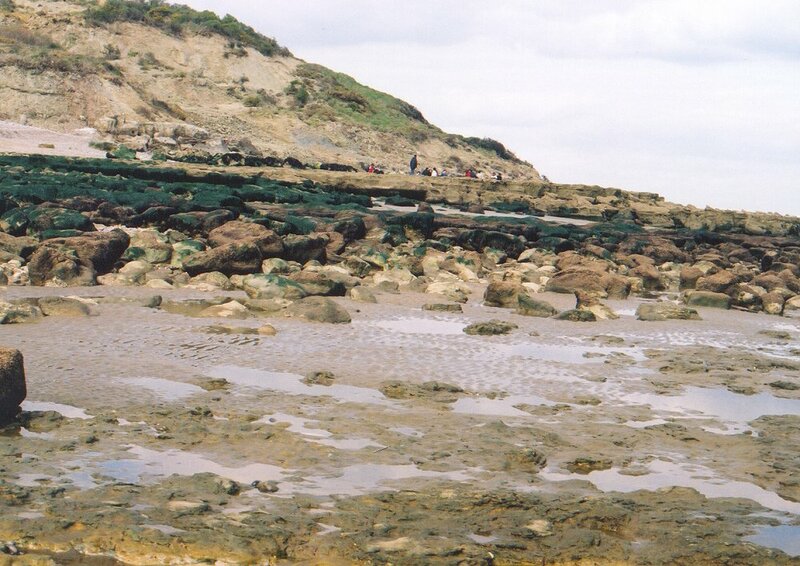 It is also present in other marine (usually glauconitic) parts of the Bracklesham Group. Particularly large specimens have been found in the Earnley Formation of King George V Graving Dock at Southampton and are preserved in the St. John Burton Collection at Southampton Oceanography Centre. This genus of gastropod is common in the Barton Clay and the Chama Member and also in the London Clay. 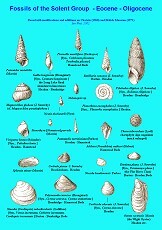 Turritella , the Screw Shell, ranges from Cretaceous to recent and a modern example is shown in the illustration. It belongs to the Superfamily Cerithiacea and is characterised by many whorls, commonly with spiral ribs or cords. It differs from some other cerithid gastropods by having a simple aperture, without canals or notches. It is normally marine and commonly of cream, brown or orange colour at the present day. The fossil examples have lost their colour and appear white. The genus at present has a wide geographical range, with a Western European species - Turritella communis Risso, which lives in sand in both shallow and deep water, and a larger Indo-Pacific species Turritella tebrebra Linnaeus, which lives in sandy mud. The local Eocene examples seem to have been mainly in fairly shallow, muddy sand. The members of the Cerithiacea are usually algal browsers, but there are some ciliary feeders (Peel in Murray, 1985). The Barton Clay section is not properly exposed now, although it probably was back in the past. The clay is 45m thick. The outcrop is in the area of the two beach cafes which lie in front of slumped and overgrown cliffs. Some sea-defences are present here and there is little exposure between the Earnley Formation of the Bracklesham Group and the Chama Member, which marks the base of the Barton Sand (the greater part of which is now known as the Becton Sand). The Chama Sand is a bed about 15m thick of argillaceous, bioturbated sand with molluscan fossils scattered through it. It can be seen behind the northern end of the northern of the two cafes. 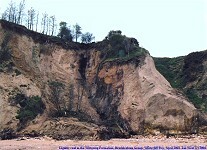 The Becton Sand Member forms a high sandy cliff, generally without fossil, just north of the northern cafe as shown in the photograph above. It is almost vertical. It consists of buff-coloured sands, sometimes cross-bedded or mottled with occasional mud bands (Insole et al., 1998). In the upper part the sand is cleaner with a few clay lenses and thin mud-pellet conglomerates and sporadic Ophiomorpha burrows. It has been interpreted as representing upper shoreface and beach conditions (Insole et al., 1998). 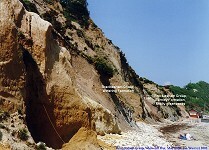 The strata above the Becton Sand Formation or Barton Sand consists of lacustrine (lake) and lagoonal marls with some sands and some cream or white lacustrine limestones. This is the Solent Group, a very shallow water facies of varying salinity that originated at the end of the Eocene and the early part of the Oligocene Epoch. The beds are quite different from most of those below. Thick grey clays with marine fossils are not normally present and glauconite is rare. The molluscs are thinner and more delicate, being suited to quieter water conditions. Freshwater pondsnails are common and the remains of turtles are found from time to time. Charophytes, the freshwater algae are present as small spherical oogonia. There are some beds with marine fossils but they are thin and do not make up a large part of the sequence. Lignite is common and insect remains occur at certain horizons. A notable and quite conspicuous bed is the Bembridge Limestone which is full of the pondsnailGalba ("Limnaea") . 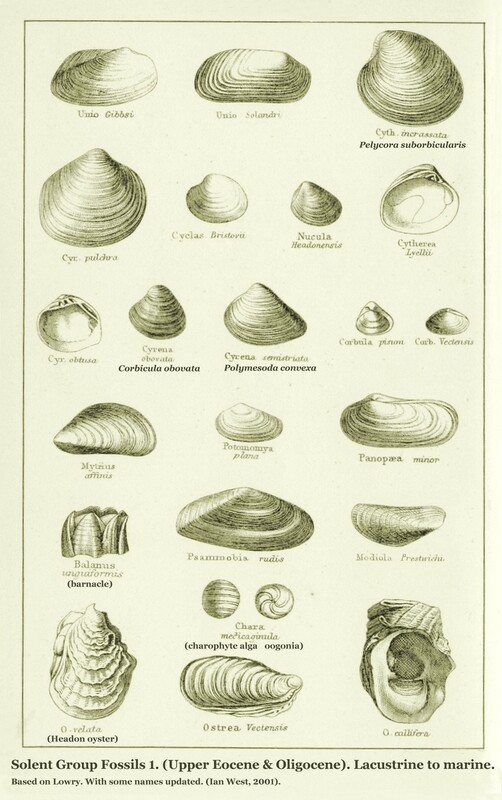 The log shown on the left here is from an old publication, (Bristow, 1862), but it gives much detail, particularly with regard to molluscs. Some of the fossil names have changed, but generally it is easy to recognise which species is referred to. A selection of just some of the many species of Solent Group (Upper Eocene to Oligocene) fossils are shown here. The left-hand diagram (coloured) is the more up-to-date. Most, but not all, of the common ones are included, together with a few rarer species. The centre and right-hand diagrams are very old with a few names updated. They may be useful supplements for identifying species not shown on the left-hand diagram. Treat the nomenclature on these with caution, though! 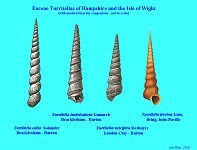 The molluscan fossils of the Solent Group are generally different from those of the marine Eocene strata beneath. They are most frequently found to be fairly small, white and thin-shelled and occur, often in abundance, in thin-bedded strata. They are preserved as aragonite, but usually without any preservation of shell colour. Most of them lived in lacustrine (lake) conditions or brackish, lagoonal water. 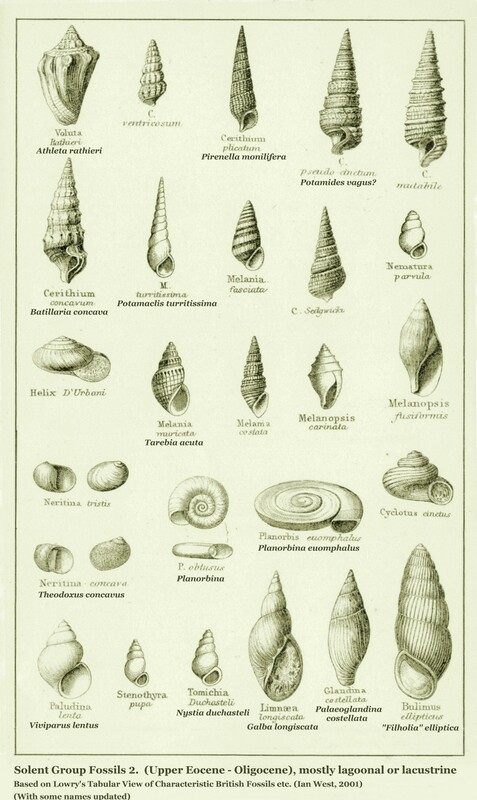 Pondsnails such as Galba ( Lymnaea ) or Viviparusare common in freshwater strata such as the Bembridge Limestone. Planorbis - type gastropods are also typical of freshwater strata, and charophyte algae may be present with them. Brackish water molluscs include Corbicula and various cerithid (ornamented and turreted) gastropods. There are some truely marine horizons, usually fairly thin and particularly recognised by the presence of oyster shells or "Barton Clay - type" gastropods such as Athleta. Left-Hand Image: A panorama of the Headon Hill Section in the northeastern part of Whitecliff Bay as seen in May, 2001. Between the Becton Sand (Barton Sand) on the far left and the Bembridge Limestone on the right are soft marls, clays and sands of the Headon Hill Formation with white, thin-shelled, mainly lagoonal or lacustrine bivalves and gastropods. These beds are mostly a rather buff colour, but there are some colour variations in detail and these have been slightly emphasised in the photograph by increasing the saturation (for the cliffs only). From this broad, distant view on the beach at low tide it is necessary to go up to cliffs to look at details. If only the details are examined and the broad view is not seen it is a little difficult to interpret this part of the section. Note that there has been a mudslide in the cliffs towards the right of the panorama. In the field look for the fossil beds, the Brockenhurst Bed and the Venus Bed. Right-Hand Image: This diagram shows the succession in this part of the cliffs with modern terminology, based, with modifications, on Insole et al. ( 1998). 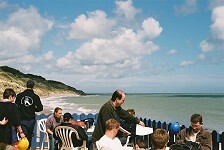 The relationship to the panoramic photograph can easily be seen from the position of the bridge, the path up the cliff, and on the right, the Bembridge Limestone. 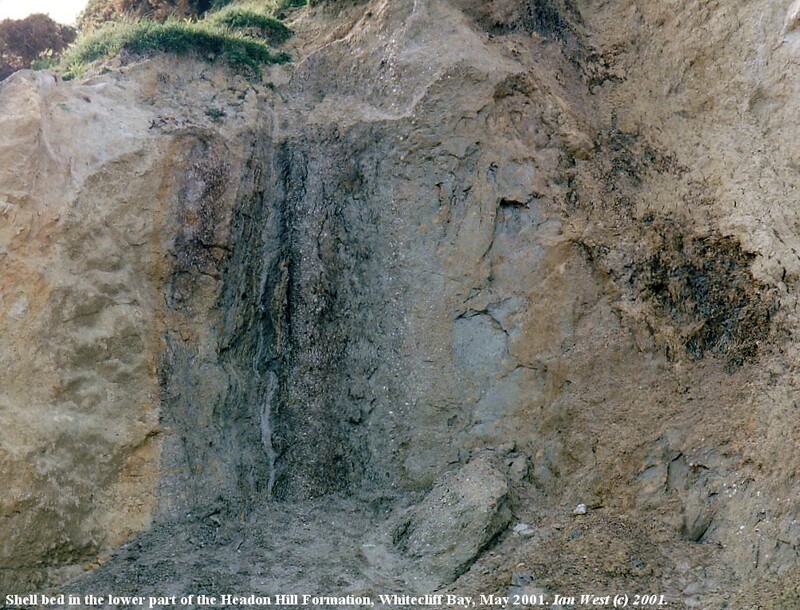 The Headon Hill Formation, shown here, is comprised of the original Headon Beds, named after Headon Hill near Alum Bay, and the original Osborne Beds, named after Osborne near Cowes and the residence of Queen Victoria. These two units have been placed together and then divided into a series of members which are shown in the cliff diagram with the synclinal fold, above. 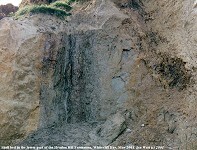 There are many thin beds of clay, carbonaceous clay, sandy clay, marl, sand etc, details of which are shown in the large vertical section through the Solent Group, above. 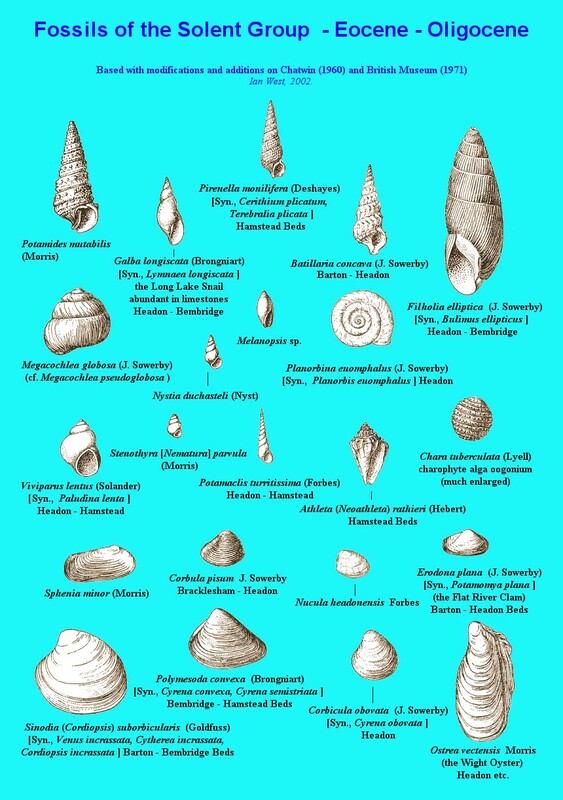 There is a wide range of molluscan fossils, most of which are white, aragonitic and rather fragile. They are of freshwater, brackish water and, in places, of marine or near-marine origin. The palaeoenvironment was, in general, a low energy lake or lagoon. 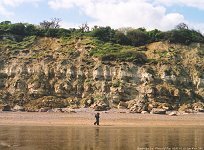 From the Becton Sand (Barton Sand) upward there is 8.2m of mostly greenish clays (the Totland Bay Member or Lower Headon Beds) with freshwater fossils, such as Planorbis, Galba, Erodona plana etc. Next at the base of the 30m thick Colwell Bay Member comes the Brockenhurst Bed. This is 0.60m of shelly brown clay with clasts of the underlying clay and with flint-pebbles. This relatively high energy, marine beach debris lies on an eroded and burrowed surface. It is notable as an example of a rapid marine transgression into a lagoonal environment. The Brockenhurst Bed is famous for its abundant fossil corals and marine molluscs found in the railway cuttings excavated from Brockenhurst to Sway in the New Forest during the 19th Century. 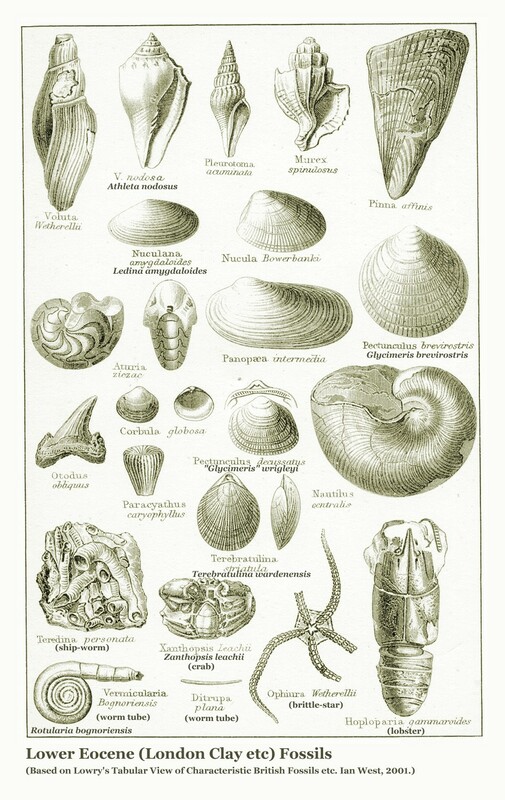 Fossil content, as listed in White (1921) , includes Ostrea, Modiola, Cardium, Cardita deltoidea, Sinodia suborbicularis, Calyptraea sp., Fusus, Athleta spinosus, "Voluta" geminata, etc. Keeping and Tawney (1881) have recorded 62 species of molluscs from this bed. 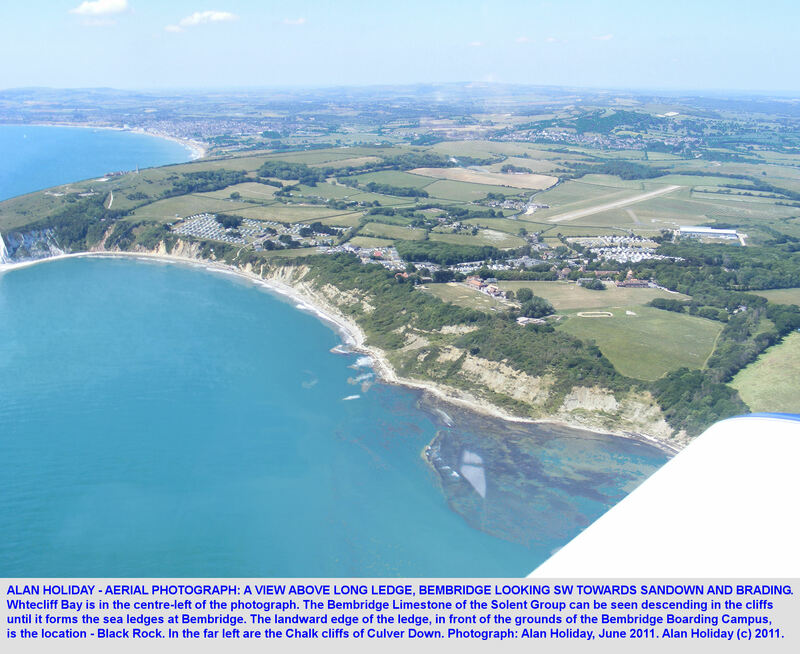 I thank Alan Holiday for permission to use his aerial photographs of the Whitecliff Bay area. 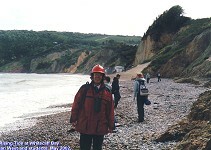 I am very grateful to Professor John Marshall for an opportunity to join student field trips to Whitecliff Bay. 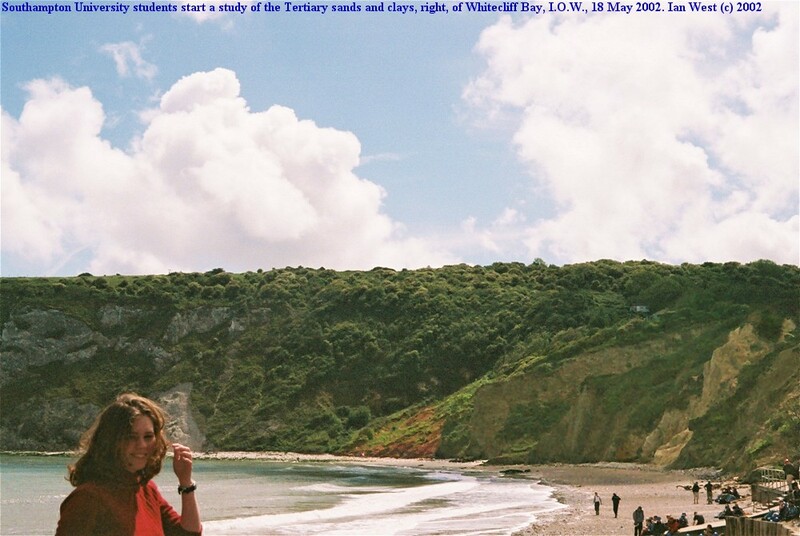 I thank Steven Apsey, Head of Geology at Sandown High School, for very helpful information regarding a cliff fall at Whitecliff Bay. Several students have kindly helped with the photography for this webpage. 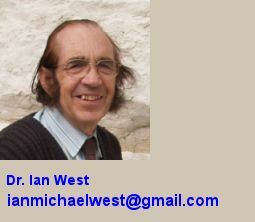 Please go to Isle of Wight Bibliography .